The Irish 2000 Guineas is one of the biggest races of the season. Aidan O’Brien’s star 3-year-old Churchill certainly looks the one to beat. He is only backable at 1/2 but you can get a HUGE 33/1 Churchill to win the Irish 2000 Guineas at Coral + £5 free bet! An easy winner of the 2000 Guineas at Newmarket last time out, Churchill can surely only improve on what was his first run in five months! Wanna boost your profits on the Irish 2000 Guineas? Don't miss this massive boost - 33/1 Churchill to win! Make your first deposit of £5 or more and your enhanced odds will appear on home page - 33/1 Churchill to win the Irish 2000 Guineas! 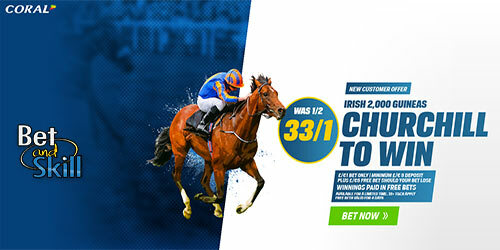 Coral are offering all new customers an amazing 33/1 for Churchill to Win the Irish 2000 Guineas, click this link to get the 33/1 price boost now. Open a new Coral online or mobile account and bet on Churchill to win the Irish 2,000 Guineas - 33/1. Offer available to UK & Republic of Ireland residents aged 18 years or over opening a new Online, Mobile or Coral Connect account in either £/€ currency through https://promotions.coral.co.uk/landing-pages/crazy-prices5, https://promotions.coral.co.uk/landing-pages/crazy-prices-online5 or the specific offer promotion box from coral.co.uk/sports/offers, between 08:00 BST Tuesday 23/05/17 until 16:10 BST Saturday 27/05/17 with the exception of new accounts depositing funds with Moneybookers, Paysafe, Neteller or Skrill. Place your FIRST real money bet as a win single £/€1 on ‘Churchill to win 33/1’ in our “My Markets” sections. "Get 33/1 Churchill to win the Irish 2000 Guineas at Curragh (Coral offer - 27.5.2017)"